You'll be £12.00 closer to your next £10.00 credit when you purchase Great Western Moguls and Prairies. What's this? Great Western Moguls & Prairies is a volume in Pen & Sword’s series, ‘Locomotive Portfolios’. 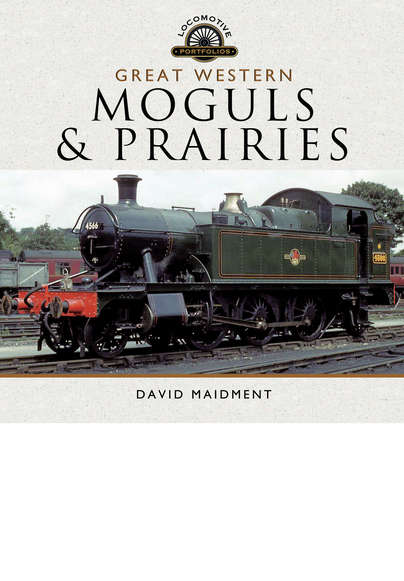 It describes the conception, design, building and operation of the fleet of Prairie 2-6-2 tank engines and the Mogul 2-6-0s designed by Churchward in the early part of the twentieth century and perpetuated by his successor, Charles Collett, in the 1920s and 1930s. These engines formed the backbone of the GWR locomotive fleet for secondary passenger and freight work for over half a century and were some of those that remained to the end of steam traction on the Western Region of British Railways. The book also covers some of the lesser known Moguls developed in the Dean/Churchward transition at the end of the nineteenth century and briefly looks at the Mogul and Prairie designs proposed by Churchward, Collett and Hawksworth but were never built. The book is copiously illustrated with over 250 black and white and 60 coloured photographs and is a comprehensive record of a group of locomotives found throughout the Great Western and its successor, the Western Region, for over fifty years. The author attached some very interesting appendices, nothing more and nothing less than 35 diagrams with the designs of Mogul and Prairie proposed by Churchward, Collett and Hawksworth but that never were constructed. A curious and interesting book for lovers of naval history of all time and who like stories based on real events. Read the complete Spanish review here. I got to the end and will start reading it again. The photographs are fascinating as are the accounts of design evolution. I would recommend the book to anyone interested in steam locomotives. Also I would recommend readers of the book to look at new build 82045 at The Severn Valley Railway it is the lost example of the final evolution of the GWR locomotive design principals. All steam obsessives will be delighted that this book is copiously illustrated with more than 250 black and white and 60 coloured photographs. It is a comprehensive record of a group of locomotives found throughout the Great Western and its successor, the Western Region, for more than 50 years. Oh and by the way, if you thought that GWR stood only for 'Great Western Railway' then think again; for many, it will always be known as 'God's Wonderful Railway'. Lavishly illustrated in both colour and black and white, with pictures from the archive and the modern day, there is much here both for the beginner and the seasoned enthusiast, with the book presenting a structured and fresh view of a popular subject. For the next instalment in Pen & Sword's high-quality series of GWR locomotive histories, David Maidment traces the bloodline of its 2-6-0 and 2-6-2T classes. As ever with these books, it gives a comprehensive history of the classes from Churchward to BR days, with excellent photographs and personal memories to add some spice to the story. Extending its scope to cover the Ivatt and BR Standard 'Moguls' built at Swindon offers something a little different. Best of all are the diagrams of 'might-have-been' locomotives - did you know that the Cambrain Railway had a 2-6-0 with outside Walschaerts valve gear on the drawing board in 1921, and the Barry Railway proposed a 2-6-2T the following year - neither of which were built because of the Grouping? If not, all is revealed here. Did you know that Frederick Hawksworth proposed building a 2-6-0 pannier tank, Churchward was asked during World War One to produce a 2-60 for universal use across all of Britain's railways or that Collett's idea for a lightweight version of the Churchward 2-6-0 was realised only, to a large extent, by the West Somerset Railway building of a freelance mogul? These are among numerous topics covered in this exhaustive volume, which covers the entire length and breadth of the subject in its title, as the latest in the publisher's series of locomotive profiles. Separate chapters cover GWR 2-6-2s large and small, Swindon-built 2-6-2Ts for the LMS and BR, and the GWR moguls and other prairie tanks and moguls absorbed by the GWR...including the Vale of Rheidol 2-6-2Ts. Lavishly illustrated in both colour and black and white with pictures from the archive and the modern day, there is much here both for the beginner and the seasoned enthusiasts, and the book presents a structured and fresh view of a popular subject. All of the locomotives which have survived into the heritage era are described in the book. What a book this is! Leafing through it I was absolutely stunned by page after page of remarkable photographs, most of which I have never seen before despite a lifelong love affair with the small prairies in particular. A terrific book which left me wanting more. Highly Recommended! David Maidment was born in 1938. He began his railway career in 1961 and although he retired from the railway industry over eighteen years ago, he is still busy as a writer, activist in the voluntary sector and as a speaker in schools, church groups and general interest clubs. In 1996, David received an OBE for services to the railway industry and, in 2012, he received a Life Achievement Award at the National Rail Awards. His published works include articles on railway history, safety, practice, performance and nostalgia, and several books including The Other Railway Children and Lives on the Line, among other publications.